This month’s issue includes a look ahead at the Annual Awards Dinner on April 18, a recap of the OPC Foundation’s Scholar Awards Luncheon with profiles of the recipients, a look ahead at a Book Night with Jason Rezaian to discuss Prisoner on April 24, an event coming up on May 9 to mark the 30th anniversary of the Tiananmen Square Massacre, and a remembrance of OPC and FCCJ member James P. Colligan. Plus, news in this month’s People and Press Freedom Update columns, a Q&A with OPC member Andre Borges, and more. This month’s issue includes an announcement about the OPC Scholar Awards Luncheon on Friday, Feb. 22, a call to RSVP for the OPC Annual Awards Dinner on Thursday, April 18, a goodbye to The Half King from Brian Byrd, a look at an exhibition of China memorabilia by Jaime FlorCruz, an update on a project about Robert Nickelsberg’s return to Guatemala, and photos from the OPC Holiday Party on Jan. 9. Plus, lots of news in this month’s People and Press Freedom Update columns, a Q&A with OPC member Alice Driver, and more. This month’s issue includes an announcement about the renaming of two OPC Awards, a call for entries in this year’s competition, an invitation to the OPC Holiday Party on Jan. 9, a recap of our panel and screening of ‘FREELANCERS’ with Bill Gentile, a recap of the panel on the future of Taiwan amid a U.S.-China ‘cold war,’ a dispatch from OPC member Chriss Swaney on her experience covering the Tree of Life temple shooting in Pittsburgh, past OPC President William J. Holstein’s thoughts on a “digital-media bubble,” a letter from the Press Freedom Committee to Mexican President Lopez Obrador, and an update on the Foreign Correspondents’ Club of Japan. Plus, lots of news in this month’s People and Press Freedom Update columns, a Q&A with OPC member Hasan Mahmud, and more. This month’s issue is packed with articles and event summaries, including a recap of a seminar on video journalism, as well as a panel about reporting in Russia, a dispatch from Vivienne Walt on the 25th Prix Bayeux, a recap of a press freedom panel at the UN, a statement from OPC Award winner Atish Saha on the state of the brutal crackdown on free expression in Bangladesh and a recap of OPC member Beth Knobel’s panel on watchdog journalism. Plus, news in this month’s People and Press Freedom Update columns, a Q&A with OPC member Amy Mackinnon, and more. We hope you enjoy this electronic digest of our September Bulletin. This issue, read highlights of the Annual Meeting on Sept. 4, an announcement that Martin Baron of The Washington Post will keynote the 2019 Annual Awards Dinner, previews of two upcoming panels in October on video journalism and the future of Taiwan, a remembrance of OPC member and LA Times editor Bob Gibson, a look at a new program that provides video therapy sessions for international journalists on the go, and a recap of the memorial service of OPC member and legend Richard Pyle. Plus, updates in this month’s People and Press Freedom Update columns, a Q&A with OPC member and former Governor Charles Graeber, and more. We hope you enjoy this electronic digest of our July-August Bulletin. This issue, we present the slate of candidates 2018 OPC Board of Governors election, with bios and statements from the candidates, and a recap of Daniel Sieberg’s program on Civil, a cryptocurrency platform for newsrooms. Plus, updates in this month’s People and Press Freedom Update columns, a Q&A with OPC member Ceylan Yeginsu, and more. We hope you enjoy this electronic digest of our June Bulletin. This month, we have a dispatch from Jonathan Kapstein on the annual general assembly of the International Association of Press Clubs in Brussels, an IAPC statement of support for a new federation of press clubs from African, Caribbean and Pacific countries, a preview of an upcoming program on the ‘Civil’ platform for journalists on July 11, a preview of an OPC Night at the Theater in September to see the play Intractable Woman, an inside look at the shakeup at the Phnom Penh Post from former deputy managing editor and OPC Foundation scholar James Reddick and a piece on the OPC’s condemnation of the EPA ban on journalists at a public event. Plus scads of updates in this month’s People and Press Freedom Update columns, a Q&A with OPC member Scott Sayare, and more. This month, we have an extended issue with a recap and highlights of the Annual Awards Dinner, including photos from the event and a list of this year’s winners. You can also read recaps of the Book Night with Steve Coll on Directorate S and a panel discussion with PEN America on social media censorship in China. Plus lots of updates in this month’s People and Press Freedom Update columns, a Q&A with OPC member Louise Boyle, and more. This month, read a recap and highlights of the OPC Foundation Awards Luncheon, previews of upcoming March events, including a panel on social media censorship in China and a Book Night with Steve Coll, a recap of the memorial service for past OPC President Marshall Loeb, a piece about the uncertain fate of the Foreign Correspondents Club of Japan, plus profiles of this year’s OPC Foundation scholarship winners, People and Press Freedom Update columns, a Q&A with OPC member Christopher Dickey, and more. This month, catch a preview of the OPC Foundation Awards Luncheon on Feb. 23, remembrances of past OPC President Marshall Loeb, a recap of the Hong Kong Hands Reunion, plus a few photos from the Holiday Party, People and Press Freedom Update columns, a Q&A with OPC member Roopa Gogineni, and more. This month, read a recap of the Q&A following the screening of The Journey Is the Destination, an invitation to the OPC Holiday Party on Jan. 10, a call for entries for the 2017 OPC Awards, a look at unionization in digital news media, and a profile of award namesake Hal Boyle. Plus People and Press Freedom Update columns, a Q&A with OPC member Borzou Daragahi, and more. This month, read a recap of the OPC’s panel on the future of Afghanistan, a new Membership Fund to help freelancers, a report on the Kim Wall memorial at Columbia University, a testimonial from Anand Gopal on reasons members should carry an OPC press ID, a report on a meeting of the International Press Institute, updates from Charles Sennott on goings-on at the GroundTruth Project and a look at the rising number of abductions and disappearances in Bangladesh. Plus People and Press Freedom Update columns, a Q&A with OPC member Tanya Bindra, and more. We hope you enjoy this electronic digest of our September Bulletin. This month, the OPC welcomes new and newly reelected governors, and introduces a new member-only Facebook group, OPC Connect, our networking service to link editors and freelance journalists. This Bulletin also includes a recap of our program at Columbia School of Journalism, “Photojournalists in the Crossfire”; an article on nonprofit journalism endeavors from the OPC’s new office manager, Amy Russo; a dispatch from OPC member Moana Tregaskis on the 75th Anniversary of the Battle of Guadalcanal; plus People and Press Freedom Update columns, a Q&A with OPC member Dalton Bennett, and more. This month’s issue features the slate of candidates for the 2017 OPC Board of Governors election, with bios and statements from the candidates. The Annual Meeting, open to all members, will be held on Tuesday, Sept. 5 at 6:00 p.m. at Club Quarters, when election results will be announced. The OPC is electing ten governors who are Active members and two who are Associate members. 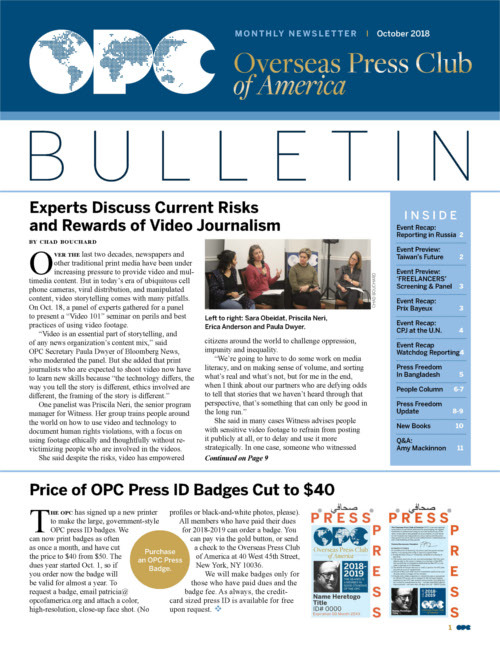 This issue of the Bulletin also includes a recap of our evening to honor retiring OPC office manager Lucrecia ‘Boots’ Duque, People and Press Freedom Update columns, a Q&A with OPC member Alessandria Masi, and more. This issue features recaps of three OPC events, including a sneak preview screening and Q&A with directors of Letters From Baghdad; a special screening with filmmakers Sebastian Junger and Nick Quested for their documentary Hell on Earth; and a panel on the future of journalism and mentorship with The Media Line. You can also read a recap of Deidre Depke’s comments at the JPC Freedom of the Press Conference in Jerusalem last month, and Michael Serrill’s round up of the annual meeting of the Foreign Editors Circle. Plus all the regular features: People and Press Freedom columns, books reviews, and a Q&A with Yaroslav Trofimov. This issue features a recap of the 78th Annual Awards Dinner on April 27, including photos from the event and a list of all of the award and citation winners. Read OPC member Brian Byrd’s report from Samantha Bee’s “Not the White House Correspondents Dinner,” and previews of upcoming OPC events, including a sneak preview screening and Q&A with directors of Letters From Baghdad on May 17 and a special screening with filmmakers Sebastian Junger and Nick Quested for their documentary Hell on Earth. Plus all the regular features: People and Press Freedom columns, books reviews, and a Q&A with Valerie Komor. This month, readers will notice significant changes in the newsletter’s design. Inside this densely packed issue, catch up on news about the Annual Awards Dinner on April 27, read recaps of the Middle East Hands Reunion and the OPC Foundation Scholar Awards Luncheon, including profiles of this year’s crop of 15 scholars, read about the memorial service for former OPC President Roy Rowan, a letter to journalists from OPC member Theo Padnos on the dangers of reporting in Syria, and a recap of an OPC/West panel on China and Trump. Plus all the regular features: People and Press Freedom columns, books reviews, and a Q&A with Vernon Silver. This month, catch a preview of the OPC Foundation Awards Luncheon on Feb. 24, read a recap of our panel at the Harriman Institute on the Trump-Putin Connection, learn about a growing mentorship network for women journalists, and see photos from the OPC Holiday Party earlier this month. This month’s issue features recaps of our panel on Tips for Aspiring Global Photojournalists, a panel on China’s plans for economic transformation, and veteran photographer Christopher Morris presents his photographs of Donald Trump’s campaign trail at the American Library in Paris. Patricia Kranz, OPC executive director, recounts her trip to the University of Michigan for a ceremony to right a wrong from decades past. Please tale a look at new upcoming events, including the OPC Holiday Party on Jan. 10, a panel on Jan. 18 with Russia experts who will examine the impact of Russian hackers on the U.S. election, and a Middle East Hands Reunion on March 1. Plus, People and Press Freedom Update columns, a Q&A with OPC member Keith Richburg, and more. We hope you enjoy this electronic digest of our November Bulletin. This month’s issue features a look ahead at the new OPC award in honor of Peter Jennings and other changes in this year’s awards competition. We also have a report from the OPC Press Freedom Committee about the new member survey, some thoughts from Lucy Westocott on her Newsweek article about sexual harassment, a recap of an OPC/West event on Russia’s role in the U.S. election, and a message from OPC Foundation director Jane Reilly on the upcoming Dec. 1 deadline for scholarship applications. Plus, People and Press Freedom Update columns, a Q&A with OPC member Deborah Amos, and more. This month’s issue features recaps of four panels, including discussions about the work of Four Women Photojournalists, International Sports and the Olympics, Free Expression in China and the Role of the UN Today. This month also has remembrances of former OPC President Roy Rowan and broadcaster John McLaughlin, as well as People and Press Freedom Update columns, a Q&A with OPC member Jim Laurie, and more. This month’s issue features a recap of our Annual Meeting with Board of Governors election results. This issue also features previews of several upcoming events in September and October, including a panel at Columbia on Sept. 7 with four women photojournalists. This issue also includes an overview of features on the new OPC website, a look at an extraordinary WNYC audio archive of OPC programs that were broadcast from 1945 to the mid-70s, as well as People and Press Freedom Update columns, a Q&A with newly elected OPC president Deidre Depke, and more. This month’s Bulletin features the slate of candidates for the 2016 OPC Board of Governors election, with bios and statements from the candidates. The Annual Meeting, open to all members, will be held on Tuesday, Aug. 9 at 6:00 p.m. at Club Quarters, when election results will be announced. Only active members can vote for active candidates and only associate members can vote for associate candidates. This issue of the Bulletin also includes a recap of our evening to honor outgoing OPC Governor Jacqueline Albert-Simon, People and Press Freedom Update columns, a Q&A with OPC member Justin Doebele, and more. This month’s Bulletin features recaps of two Book Nights, including discussions with Anne Garrels on Putin Country and Andrew Nagorski on The Nazi Hunters. Please note that the OPC Annual Meeting will be held on Aug. 9 this year. Other features include a recap from former OPC President Michael Serrill about the Foreign Editors Circle Meeting, a recap from OPC Executive Director Patricia Kranz on the IAPC Meeting in Geneva, and an update from OPC friends and correspondents on the west coast. Plus, People and Press Freedom Update columns, and a Q&A with OPC member Vivienne Walt. This Bulletin features a recap of the Annual Awards Dinner, including photos from the event and a list of award recipients. Please note the call for nominations for the 2016 OPC board elections. The issue also includes a look at the upcoming Book Night to discuss Anne Garrels’ Putin Country, a recap of a forum at the International House for World Press Freedom Day. Plus, People and Press Freedom Update columns, and a Q&A with OPC member Kim Hjelmgaard. This Bulletin features a curtain-raiser for the Annual Awards Dinner on April 28, look at the upcoming Book Night to discuss Andrew Nagorski’s Nazi Hunters, recaps of OPC events including our forum on Press Freedom in Turkey, a discussion of Intelligence Gaps in the age of Encryption and the Russia Hands Reunion. This month also showcases this year’s OPC Foundation Scholars and a recap of the foundation’s annual luncheon. Plus, People and Press Freedom Update columns, a Q&A with OPC member Valerie Hopkins, and more. This month’s issue features a look at the upcoming Russia Hands Reunion and personal memories from OPC executive director Patricia Kranz, who covered Russia in the 1990s. The issue also includes recaps from a busy month of events, including a Book Night with Mei Fong on One Child, the Remembering Castro Lunch, a panel on How to Use Encryption to Protect Your Sources, and a Book Night with Rod Nordland on The Lovers. Plus, People and Press Freedom Update columns, a Q&A with OPC member Tim Maceda, and more. This month’s issue features a look ahead at the OPC Foundation luncheon with keynote speaker Kathy Gannon, analysis from OPC Governor Azmat Khan on why Al Jazeera America is shutting its doors in April, a look back at Fidel Castro’s remarkable appearance at the OPC in 1959, as well as a few photos from this year’s Holiday Party. Plus, People and Press Freedom Update columns, a Q&A with OPC member Anita Snow, and more. This month’s Bulletin features a recap of our panel on journalist safety with press freedom advocates and journalists, an article from Washington Post foreign editor Douglas Jehl about Jason Rezaian’s incarceration for more than 500 days, a recap of our event with OPC Governor Daniel Seiberg on tech tools and Google News Lab, an inside look at Cambodia’s newspaper wars from James Brooke and a dispatch from the Amazon River as 95-year-old OPC veteran Roy Rowan and his son Marc Rowan recount a dream trip into the jungle. Plus, People and Press Freedom Update columns, a Q&A with OPC member Stanley Reed, and more. We hope you enjoy the November 2015 Bulletin. This month’s issue features a recap of our standing-room-only Book Night with Linda Hervieux, a few words from Marcus Mabry about his new gig at Twitter, remembrances of OPC member George Burns, a report from OPC Foundation executive director Jane Reilly about hostile environment training for freelancers, and a dispatch from Foundation scholar Makini Brice on her fellowship in Dakar with Reuters. Plus, People and Press Freedom Update columns, a Q&A with OPC member Elena Becatoros, and more. We hope you enjoy this electronic digest of our October Bulletin. This month we are announcing new OPC photo ID card options for working press members. The October issue also includes recaps from a busy season of events, including former OPC President Michael Serrill’s report on a meeting about protocols for reporting from conflict zones; a recap of our panel on Covering the Greek Debt Crisis; a discussion with Emmy-winning filmmakers on Firestone and the Warlord; an evening with Chinese dissident Wu’er Kaixi; and our China Shocks panel on global reverberations under President Xi Jinping’s rule. OPC Foundation scholar Katerina Voutsina writes about reporting on the Greek debt crisis for the Wall Street Journal. We’ve got previews of two upcoming events: a Book Night with Linda Hervieux on her book about African-American soldiers during WWII, and an evening with OPC Governor Daniel Sieberg as he explains Google News Lab. Plus, People and Press Freedom Update columns, a Q&A with OPC member Rod Nordland, and more. We hope you enjoy this electronic digest of our September Bulletin. Scroll down to see summaries and links to the stories on our website. This month’s issue features results of our Board of Governors election; previews of three upcoming OPC events; a dispatch from OPC Foundation scholar Ted Anderson about the bombing in Bangkok that capped of his internship for the Associated Press; a look at Malaysia’s crackdown on two news operations; and a followup with OPC Madeline Dane Ross Award winner Atish Saha after his trek across the U.S. Plus, People and Press Freedom Update columns, a Q&A with OPC member Dana Thomas, and more. We hope you enjoy this electronic digest of our July-August Bulletin. This month’s issue features the slate of candidates for the 2015 OPC Board of Governors election, with bios and statements from the candidates. Votes must be entered by Monday, Aug. 24. The Annual Meeting, open to all members, will be held on Aug. 25 at 6:00 p.m. at Club Quarters, when election results will be announced. This issue of the Bulletin also includes a call for stories and recipes for a new section of the website, an article from Azmat Khan about her recent investigation into U.S.-funded school projects in Afghanistan for BuzzFeed, plus People and Press Freedom Update columns by Trish Anderton, a Q&A with OPC member Jonathan Kapstein, and more. You can print or read the entire newsletter by downloading the PDF of the July-August Bulletin in the link below. We hope you enjoy this electronic digest of our June Bulletin. Scroll down to see summaries and links to the stories on our website. This month’s issue features a recap of a forum on China’s Crackdown, a call for Bulletin submissions from members, a behind-the-scenes look at OPC member Ben Taub’s article on ISIS for The New Yorker, arecap of a Book Night with Rena Pederson on The Burma Spring and a report from OPC member Edith Lederer on her trip to Vietnam for the 40th reunion of war correspondents. Plus, People and Press Freedom Update columns by Trish Anderton, a Q&A with OPC member Rebecca Fannin, and more. We hope you enjoy this electronic digest of our May Bulletin. This month’s issue features a recap of the Annual Awards Dinner, photos from the event, a list of this year’s recipients, a call for candidates for the 2015 OPC board elections, a preview of an upcoming panel on China’s crackdown on civil society and a preview of a Book Night with Nazila Fathi. Plus, our People and Press Freedom Update columns, a Q&A with OPC member John Moore, and more. We hope you enjoy this electronic digest of our March/April Bulletin. This month’s issue features a curtain raiser for our upcoming Annual Awards Dinner, a recap of our panel at the United Nations on the need for more women’s voices in combating extremism around the world, a recap of this year’s OPC Foundation Scholar Awards Luncheon with information about the winners, and a look at a one-day course on situational awareness held for the winners. Plus, the People and Press Freedom Update columns, a Q&A with OPC member Tracy Wilkinson, and more. We hope you enjoy this electronic digest of our February Bulletin. This month’s issue features a story about the release of critical new guidelines for media organizations and freelancers to improve safety while reporting in danger zones, a look at the life and career of Bob Simon, commentary pieces from former OPC President Michael Serrill and club member Mort Rosenblum on Bob Simon and Brian Williams, recaps of our panels on the culture of satire and covering Ebola, a special screening of The Rise of ISIS, a book night with New York Times columnist Roger Cohen and an update on our Video Memoir series. Plus, Susan Kille’s People and Press Freedom Update columns, a Q&A with OPC member Kristina Shevory, and more. We hope you enjoy our January Bulletin, the first of 2015. This month’s issue features a look ahead at the OPC Foundation luncheon with keynote speaker Sebastian Junger, former OPC President Larry Martz’s review of James Risen’s new book Pay Any Price, a preview of a new OPC e-book about China from Bill Holstein, a recap of ourbreakfast panel on geopolitical predictions for 2015, plus photos from our holiday party, Susan Kille’s People and Press Freedom Update columns and more. Members can print or read the entire newsletter by downloading the PDF of the January Bulletin in the link below. The December Bulletin features a recap of discussion at the Frontline Club in London on how best to keep freelancers safe in hostile areas. Read about our book night with Anya Schiffrin and her anthology of investigative reports from around the world in Global Muckraking. Susan Kille writes about the impact of Luke Somers’s death. Plus Kille’s People and Press Freedom Update columns and more. The November Bulletin features an update on club business from Marcus Mabry, previews of our upcoming mixers and a book night with Anya Schiffrin on Global Muckraking. We also have recaps of panels on how to freelance safely and how to handle thorny reporter-embassy relations, as well as a book night with Nicholas Kristof and Sheryl WuDunn on their new book about philanthropy A Path Appears. Plus Susan Kille’s People and Press Freedon Update columns, a Q&A with OPC member Spencer Platt, and more. The October Bulletin features recaps of the club’s events over the last month, including the China Hands Reunionas well as panels on rising risks to freelancers, OPC award-winning photographers, a book night with Sheila Weller and a chat with editors at digital media companies that are expanding their overseas coverage. It also includes a preview of the upcoming forum on freelancing safely and a review of Beth Macy’s Factory Man. Susan Kille writes new People and Press Freedom Update coulmns, book reviews and a Q&A with OPC member Haley Sweetland Edwards. The September Bulletin features election results and a welcome statement from the OPC’s new president, Marcus Mabry. The issue also offers previews of upcoming events in September, including a Sept. 9 panel about the risks of reporting in conflict zones in light of brutal murders of James Foley and Seven Sotloff; the September 12 China Hands Reunion, a panel on expanding international coverage from Buzzfeed, Mashable and Vice; and an evening with OPC photo award winnerswith their works on display. People columnist Susan Kille recounts her brief encounter with James Foley at an OPC awards dinner in 2012. Kille also launches a new column, Press Freedom Update, and treats us to a Q&A with OPC member Steve Herman. The July/August Bulletin includes the full election slate and a preview of the September 12 China Hands Reunion. People columnist Susan Kille writes a feature on the sentencing of journalists in Egypt. The issue also has a roundup of press club happenings, including an update on the Belarus press club, and event recaps of the International Association of Press Clubs in Vienna and the Federation of Press Clubs in Jerusalem. The June issue includes the two OPC events: a seminar on June 23 about investigative reporting techniques and panel discussions on June 25 about innovating in global hotspots. Board member Brian Byrd writes a recap of the Empire State Building lighting in honor of the OPC’s 75th anniversary. OPC Scholar Sam McNeil writes on affording international environmental journalism. Outgoing Executive Director Sonya Fry relays her experience at an OPC event in Bayeux, France, and the Club also got to toast Sonya at her farewell party on June 5. Susan Kille files the “People” and “New Books” columns and includes an update on China. Bulletin and Website Editor Aimee Vitrak also bids adieu on page 11. The April issue offers curtain raisers on the OPC’s biggest annual event, the Awards Dinner on April 24. The Club also has a book night on Monday, March 31 for The Russians: The People Behind the Power. OPC member and former Bulletin editor Sibby Christensen offers recollections from her time at the OPC. There’s also a recap of the 75th Anniversary breakfast sponsored by Bloomberg with the tribute to OPC member Edie Lederer who took home the Fay Gillis Wells Award. Susan Kille writes media news and notes in her “People” and “New Books” columns. The February/March Bulletin contains recaps of the three February events: the D.C. panel on Pakistan, the Arizona panel on covering the border and the OPC Scholars Luncheon. There are also features on OPC member Vivienne Walt‘s exclusive Hollande interview, OPC member Andrew Kreig‘s recollections of his mother and the OPC Cookbook, the memorial service for OPC member Helen Rowan and the continued persecution of journalists in Egypt written by Susan Kille. The first issue of the new year recaps the holiday party at the Algonquin Hotel and introduces the Club’s three February programs: a panel discussion on stories you haven’t heard from Pakistan in Washington D.C., a panel discussion on reporting border conflict in Tucson, and the annual Scholars Luncheon. Susan Kille writes the “People” column and also updates on China’s visa policy and journalism, by the numbers, in 2013. This 16-page issue includes the preview of the OPC’s 75th Anniversary year with kick-off celebration at the Algonguin Hotel. The December Bulletin also includes recaps from the New York events at New York University and Americas Society, Paris and London. OPC members also reflect on covering the JFK assassination, including former OPC President Richard Stolley who secured the now-famed Zapruder film for Life magazine. Susan Kille writes her columns and also a recap of the continuing erosion of press freedom in China. The November issue has previews galore for our events in New York City, Paris and London. Be sure to catch up on our October events that featured Global Broadcaster “wars” and recollections on covering China’s civil war with Roy Rowan and Seymour Topping. To round out the “Topping edition” is Audrey Ronning Topping discussing her most recent book: China Mission, previewed and Q&A. The October Bulletin offers two curtain raisers for the month’s programs including Seymour Topping and Roy Rowan‘s discussion on launching their careers by covering the Chinese Civil War. Susan Kille writes her column plus a feature on the Barrett Brown case and its implications for press freedom in the United States. The September issue is packed with news updates and roundups. Susan Kille leads the newsletter with a media buying-and-selling wrap up. She also wrote a feature on the latest news from Egypt and a profile of OPC member Steve Herman who got to tour North Korea. The issue also includes a tribute to OPC members Helen Thomas and Naomi Barry, who both died this summer. The July/August issue includes the annual election slate and information about the OPC’s first online voting system. There’s also a curtain raiser on the film screening in August and all the lastest news from the industry by People columnist Susan Kille. This Bulletin provides an overview of the U.S. government’s continued abuse of the free press including a letter written by OPC President Michael Serrill to President Obama. We also have a recap of the Michael Kamber photo exhibition and book night, the People and New Books columns written by Susan Kille, a profile of long-time OPC member George Bookman among other features. The combined edition provides a recap of the 2013 OPC Awards Dinner with photos and quotes from the winners. There’s also the roster of winners and plenty of photos from the pre- and after-parties. Larry Martz writes about Mikhail Beketov who died on April 8 four years after being beaten four years ago and left brain damaged with an amputated leg and three fingers. Susan Kille will fill you in on the industry latest with her People and New Books columns. There’s also a curtain raiser for the OPC event with photojournalist Michael Kamber on May 15. The February issue offers curtain raisers to two events in March: the second Tchotchke Night on March 8 and a panel discussion on the Sunni/Shia divide on March 13. There are recaps of the February events, OPC member Steve Raymer‘s book night and the OPC Foundation Scholarship Luncheon where a new fellowship iniative was announced and David Rohde gave a stirring speech. Susan Kille also wrote about how hacking impacts press freedom in addition to her People and New Books columns. This month’s newsletter kicks off 2013 with announcements of the OPC Scholars Luncheon and a book nightfeaturing Steve Raymer in February. We also include a recap of the holiday party and events in the media business from Susan Kille. Kille also unearthed a story about one of the founding members of the OPC, Bob Benjamin, whose likeness was the inspiration for illustrations and the character “Pops.” Former OPC President Larry Martz has a new book out, a work of fiction titled, To Know the Truth. This month’s newsletter includes the story of how the OPC archive’s missed the wrath of Hurricane Sandy courtesy of former OPC President David A. Andelman, a recap of the North Korea panel and a profile of defector Danny Lee written by event organizer William J. Holstein and Susan Kille writes her usual columns plus a special feature on the high death toll for journalists in 2012. NOTE: The PDF of this issue is not available. The November issue includes a curtain raiser on the North Korea panel discussion set to take place on Monday, December 3. There’s also a recap written by OPC Foundation President William J. Holstein, who has organized the OPC event, about a North Korea event at Columbia University that discussed the AP’s bureau in Pyongyang. There’s a recap of OPC Scholar Gregory D. Johnsen‘s book night and the always informative People column written by Susan Kille. The October issue includes a curtain raiser for the November Book Night with Gregory D. Johnsen who will discuss his work in Yemen. There’s also a recap of the Steve Shepard book night and the memorial for Arthur Ochs “Punch” Sulzberger who died September 29, and a reflection of his decision to print the Pentagon Papers from OPC board member Seymour Topping. Susan Kille will fill you in on the latest news from the field in the “People” column, and for those with a journalism-related book in them, CUNY School of Journalism now has a publishing imprint. The September Bulletin includes a curtain raiser for our next event, a book night with Steve Shepard on October 15. We also have a recap of the annual member meeting, a letter from the new OPC President Michael Serrill and a feature about the recent killings of journalists in Syria. Susan Kille is back with the “People” and “New Books” columns. The July/August issue of the Bulletin contains the full 2012 election slate for OPC board members and its officers. You will receive a paper ballot in the mail to cast your vote — if you do not, please e-mail or call the OPC office. This month’s issue also recaps the Egypt panel event, discusses the odd threat Russia’s “top cop” made to a journalist, reviews the problems for journalists and political changes in Mexico and even offers up a suggestion on how to parlay your expertise into a vacation. This issue of the Bulletin includes a preview of our June Egypt Panel event, a Q&A with Kristen Gillespie who is helping to launch an English-language opposition news channel in Syria, a tribute to Horst Faas written by OPC member and legendary AP reporter Edith Lederer, an opinion piece on the recent French election by OPC treasurer Jacqueline Albert-Simon and Natalie Rinn, and a recap of the book night at the AP where AP CEO Tom Curley apologized for firing reporter Ed Kennedy in 1945. The May Bulletin is filled with OPC-event news with this year’s Awards Dinner recap and photos and the Club’s first joint program with the National Press Club in Washington, D.C. Susan Kille trekked North to the Bronx to report on Sebastian Junger‘s medic training program for journalists, and Allan Dodds Frank writes a tribute to OPC member Mike Wallace. This month’s newsletter includes a curtain raiser to our illustrious awards dinner on April 25, and a book night at AP headquarters on May 8. memorial tribute to Marie Colvin written by Charles M. Sennott. OPC President David A. Andelman gives insight to his President Award recipient, Ted Turner. Susan Kille fills members in on the latest media news and two recently published books by journalists. This month’s newsletter includes memorial tributes to Anthony Shadid, George Esper and Andy Rooney. OPC President David A. Andelman provides an update to Club news and an introduction of this year’s awards ceremony. Susan Kille fills members in on the latest media news and two recently published books by journalists. The February Bulletin includes a curtain raiser for this year’s OPC Foundation Scholarship Luncheon on February 17. This year’s keynote speaker will be Jeff Fager from CBS. There’s also a documentary screening and discussionfor “Under Fire: Journalists in Combat,” on January 19. We’ve recapped the Kandahar book night for those who could not attend and William J. Holstein weighs in on what journalists can do to maintain their influence on the business side of the news business. Susan Kille provides news and notes from the industry in this month’s People column and also highlights three new books on page 12. This month’s Bulletin kicks off the new year with the first OPC event on January 4: a book night with a holiday mixer. Eating Mud Crabs in Kandahar is the book that will be discussed. The book consists of reports by foreign correspondents that are sometimes harrowing, frequently funny and riveting stories about food and eating under extreme conditions. The January issue also includes recaps of the Holbrooke retrospective at Asia Society and Rebecca Fannin‘s luncheon where she discussed the emerging markets in Asia. Susan Kille reports in for the People column and New Books.